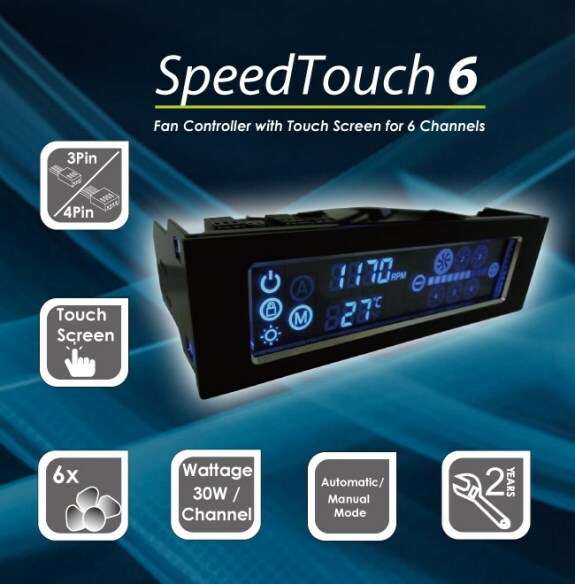 GELID introduces the SpeedTouch 6, a new touch-screen fan controller with six 30W channels. The MSRP is $35 (29EUR). The “SpeedTouch 6” provides a total of 6 channels with 30W performance per channel. This fan controller with an aluminum case is fully compatible to all types of fans using voltage control. Each channel includes a temperature sensor. The speed of each channel can be adjusted automatically or manually. To ensure a definite fan speed accuracy the fan speed is displayed at two digits accuracy e.g if the effective speed is 1653RPM then it will be displayed as 1650 RPM. The temperature is shown in Celsius or Fahrenheit. Even the brightness of the control panel can be adjusted according to desire.